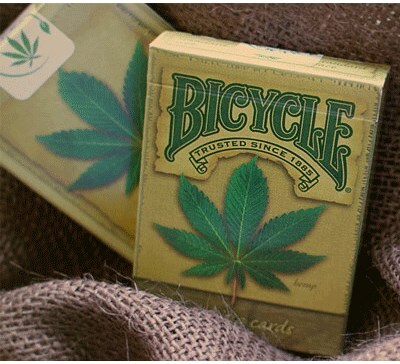 The Bicycle Brand Hemp Deck features a distinctive hemp leaf design on the tuck and the card backs. Bicycle's Hemp Deck features our classic air-cushion finish and a weathered burlap look. 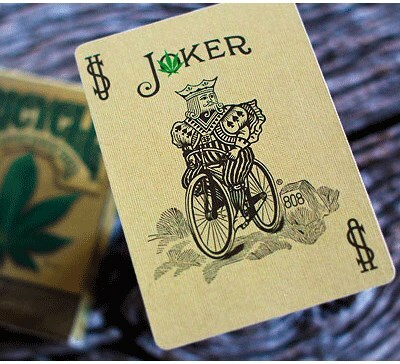 The deck contains original artwork on the Ace of Spades, Joker, back design, and tuck, with unique coloring on the court cards. 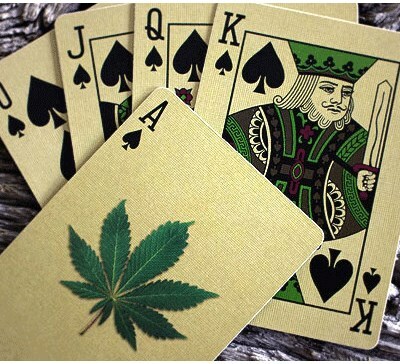 Made in the USA at The United States Playing Card Company on quality stock with a premium finish. Hemp and its uses are often the subject of conversation, especially in a world seeking to become more "green" and earth friendly. Hemp is a very environmentally friendly substance used for both its fiber and its seeds. Hemp is used today for a variety of products including textiles, clothing, body products, and even bio-fuel.